Excellence in concrete design and construction was celebrated at this year’s Irish Concrete Society’s 37th annual awards evening, which took place on Saturday, 30th March 2019 in the Clayton Hotel, Burlington Road, Dublin 4. The awards recognise excellence in both design and construction in concrete and are adjudicated by a distinguished, independent jury of industry professionals. The main awards jury, consisting of Karen McEvoy (Bucholtz McEvoy Architects), Des Mulcair (Roadbridge) and Jerome O’Brien (JB Barry and Partners), reviewed a total of 25 projects nominated in three categories of main awards – Element, Infrastructure and Building. O'Donnell + Tuomey's Cavanagh Bridge, UCC was named the Element Category winner and the Overall Winner. 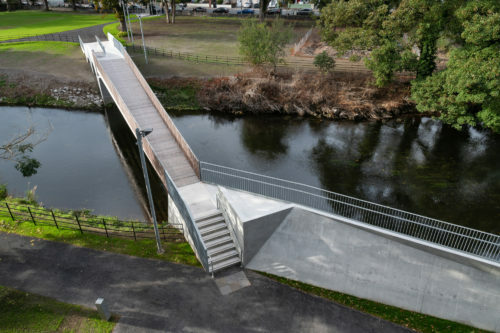 “Great care and consideration has been given to the crafting of the abutments of this bridge, a delightful addition to the banks of the Lee, facilitating pedestrian connectivity across the river within the UCC campus. “The plasticity of concrete has been used to great advantage to sculpt elegant forms in the differing conditions at each side of the bridge, on one side seamlessly offering universal access in a 20m long ramped form, simultaneously offering a place to sit, while on the other integrating playful parabolic arches sitting in the floodplain below.